Clinical presentation A 28-year-old woman presented with a 3-year history of chronic watery diarrhoea along with abdominal pain and bloating, which could mostly be alleviated after defecation. Her symptom of diarrhoea, at least three times a day, could be relieved by neither probiotics nor antidiarrhoeal agents. She had also lost 5 kg in the last month. She denied family history, poor vaccine responses or significant infections in early childhood except for an allergy history to intravenous immunoglobulin (Ig) with immediate dyspnoea, palpitations and hypotension. Laboratory investigations suggested that the stool specimens were negative for viruses, parasites or bacteria. Laboratory evaluation revealed a low serum globulin level, 14.5 (reference range, 20–30 g/L); serum Ig levels were significantly abnormal: IgA <0.27 (0.7–4 g/L), IgM 0.24 (0.4–2.3 g/L), IgG 1.3 (7–16 g/L); white cell count 15.4×109/L (3.69–9.16×109/L); C-reactive protein (CRP) 20.5 (normal <10 mg/L); CD4+ lymphocyte/CD8+ lymphocyte 1.09% (1.5%–2%). Other laboratory findings were unremarkable, for example, tumour markers, autoantibodies and HIV, and so on. CT showed mesenteric nodule-like images and thickening of the wall and mucosa in small intestine. 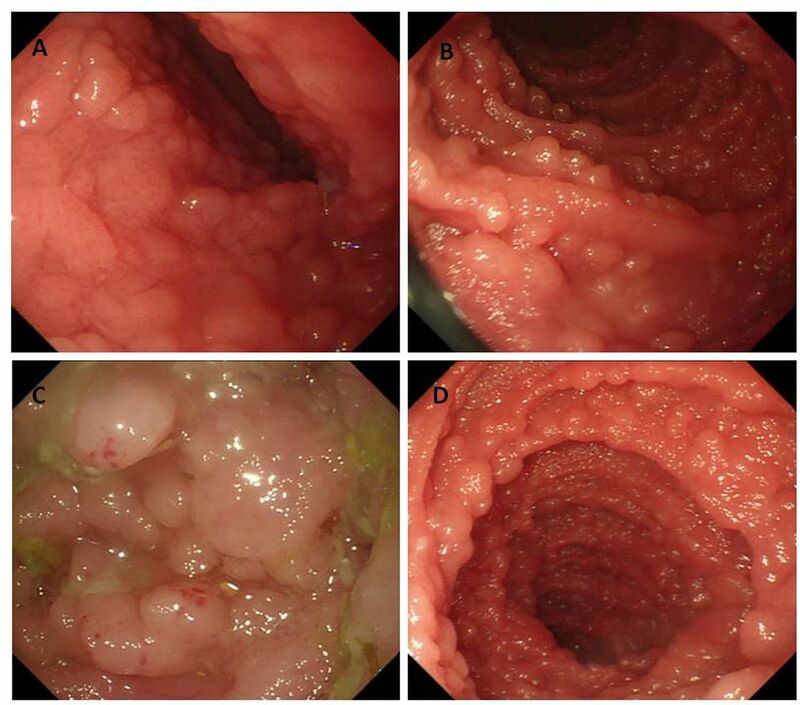 Peroral and transanal enteroscopy respectively demonstrated swelling mucosa and continuous granular lesions from duodenum to middle jejunum, and from middle ileum to terminal ileum (figure 1A–D). Endoscopic images show swelling mucosa, dense nodular lesions in duodenum (A), upper jejunum (B), upper ileum (C) and terminal ileum (D). Contributors CBZ drafted the manuscript. HL, YXC and JYF critically revised the manuscript.